Having rescued the correct draft of the Prima pattern I plan to proceed with making up the Navy Blue Ponte Jersey that I bought from Fabricland in Salisbury. 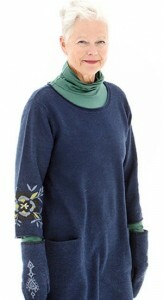 As inspired by an advertisement for www.gudrunsjoden.com I will have some machine embroidery on the sleeve hems and at the neckline of this simple shift style. I will include some bust and body shaping darts but exclude the large pockets at hip level as otherwise the dress could make me look heavier than I really am. I just love gudrunsjoden clothing and by using them as inspiration I can have a very personal and unique wardrobe for the coming season. As promised, this dress, after a great deal of fitting finessing, is now completed. Having used the wrong version of the pattern, the dress was initially way toooooo big with bust darts finishing approximately 2 inches above my personal bust point ! I have taken in the sides by approximately 2″ per side it is now a much better fit than at the original first fitting, when I nearly gave up on the whole project. The fabric, bought online through eBay, was sold as Ponte Jersey and in my ignorance I was expecting it to be a little heavier and a bit more substantial, consequently the dress does not have quite the drape I was hoping for. (Lesson learned – when using a new fabric/fibre, best to check out the fabric for real rather than online photographs and descriptions). The hem of the sleeves and bias frill is top-stitched with a twin needle, a new procedure for me. 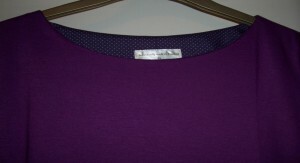 As shown in the 3rd photo in order to reduce bulk I used a remnant of purple pin-spot cotton for the neckline facings . 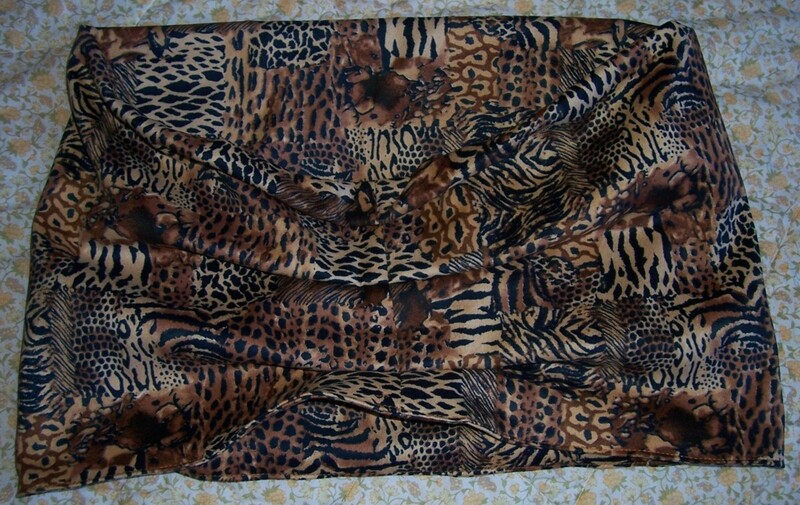 I show the dress both with and without the animal print snood. Whilst I have the machine threaded up with Purple thread I will make another snood/infinity scarf with the leftovers of the Purple jersey to provide yet another styling option. 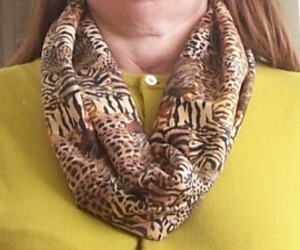 I love wearing scarves and have noticed that lately there are a lot of “snoods” or Infinity Scarves about. They appear to be the “on trend” accessory. I have downloaded some knitting patterns which I plan to make during the winter months but in the meantime thought I would have a go at sewing a version to wear with the vast number of Autumn-coloured cardigans and sweaters that I have. I checked out online and through trial and error came up with a pattern which uses a piece of fabric approximately 37″ x 25″ (includes 1/2″ seam allowances all around). 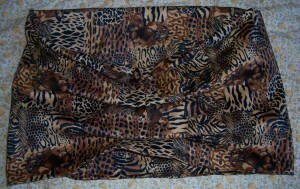 For this project I used a fabulous animal print “sueded” finish jersey fabric bought from Fabricland in Salisbury. I stitched the centre back seam (25″ ) to make a circle of fabric and then folded in half lengthwise to make a circle 36″ circumference by 12.5″ deep. I tucked in the seam allowances on the raw edge and machine top stitched. At the centre back I made 3 tucks to reduce the amount of fabric sitting at the back of my neck. I have been delighted with the finished result which goes, not only with the Autumn-coloured cardigans and sweaters but also adds a stunning finish to the purple jersey dress discussed in the previous post. Purple Jersey Prima Dress no 50. Sewing has taken rather a back seat whilst I have been recovering but at the same time I just can’t keep away from the machine! 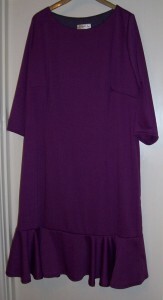 I have been working on yet another version of the Prima Dress (no 50) using a Light Purple Ponte Jersey. 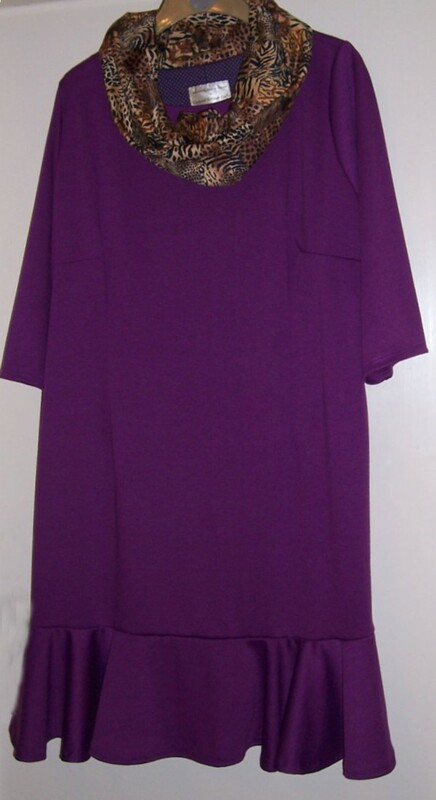 It took a while to completely re-thread the Juki overlocker with Purple thread and yet another session just to cut out the dress. Unfortunately at first fitting stage I discovered that I had used a drafted version of the pattern made when I was a “little” larger size than I am now! Having taken in over 1″ at each side seam and re-sewn the bust darts twice (!) this has not been the simple straightforward project that I originally planned. Still I will get there. Hopefully once all the refinements and adjustments have been completed plus the dress has had the final press it will be worn in conjunction with …. 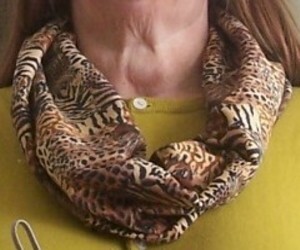 the Leopard Print Snood. Please see the next post. At last, Polly is finished. This project has taken much longer than usual as I have to pace myself and not sit for too long in one position whilst my total knee replacement continues to mend. 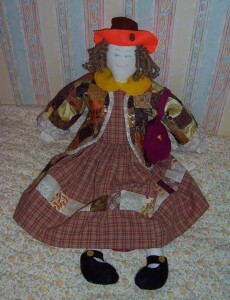 I made the quilted patchwork jacket using 2″ squares in Autumnal colours but when I dressed Polly in the jacket, I realised that the colours did not co-ordinate well with the dress. Those that know me will also know that I do like to have clothing co-ordinated! So – I made another dress. For the main fabric I cut up one of my husband’s old shirts and used one of my existing doll dress patterns. This has a lined bodice and long gathered sleeves with cuffs that are set in “on the flat” before stitching the side and sleeve seams all in one. This time I had allowed sufficient overlap at the back bodice to work a 3- buttons and buttonholes fastening. I also made a detachable collar in Bright Yellow felt with a pinked edge. 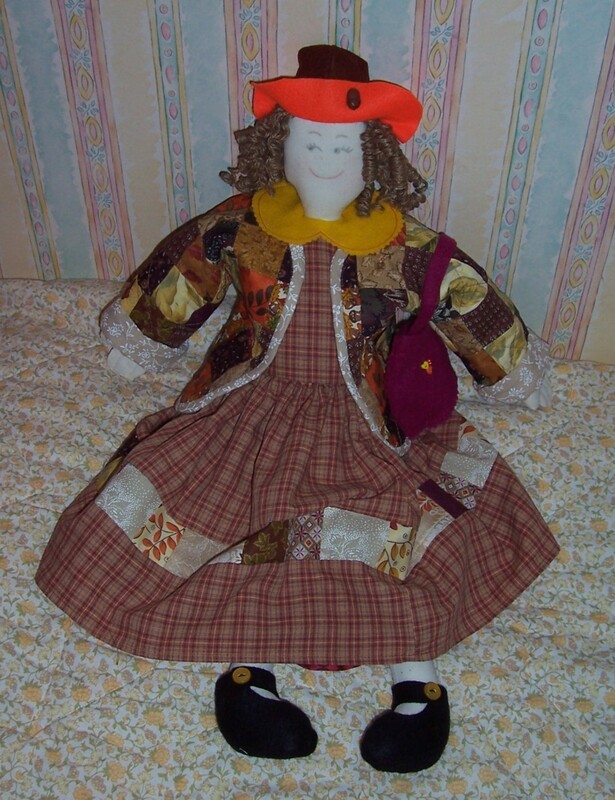 I have completed a Red flannel waist petticoat, Brown and Orange felt hat and Burgundy felt bag which is decorated with 3 heart-shaped buttons. I am pleased with the resulting doll who now sits next to Dolly the Dachsund pin dog in my Sewing Room.